The story is told in two of the Gospels (Matthew 14: 3-12 and Mark 6: 17-29): St John the Baptist is in prison for denouncing the adulterous and incestuous liaison between King Herod and Herodias. Salome (Herodias's daughter by a previous marriage) so delights the King with her dancing that he promises to give her anything she wants. 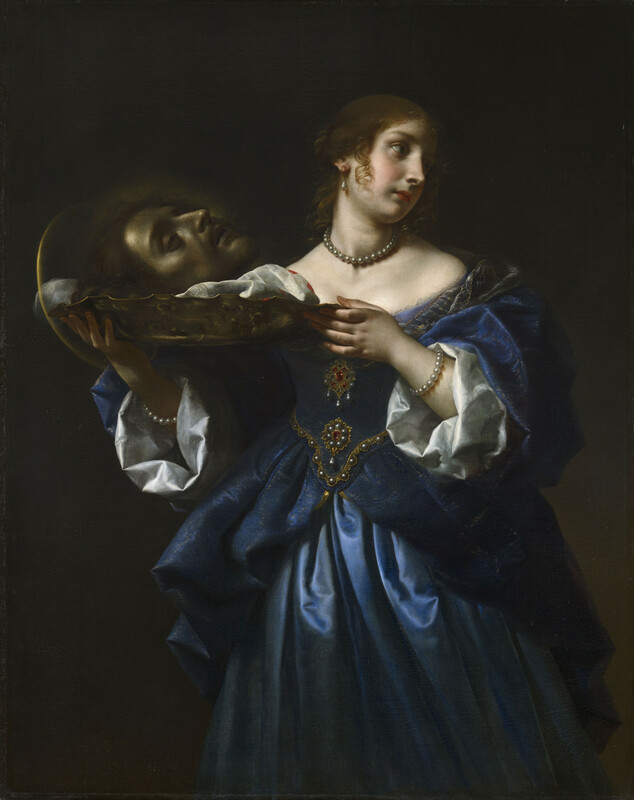 Prompted by her mother, she asks for John the Baptist's head on a platter. This painting entered the Royal Collection as a gift from Sir John Finch to King Charles II. As English Resident at the court of Grand Duke Ferdinand II between 1665 and 1670, Finch met Carlo Dolci in Florence and had the opportunity to commission a number of works from him, including the self-portrait in the Fitzwilliam Museum in Cambridge. From the evidence in Finch's notebooks, written during his sojourn in Florence, we know that he admired and befriended the artist. According to Dolci's biographer Filippo Baldinucci, Finch commissioned this work and two companion paintings, the Penitent Magdalen (RCIN 405546), also in the Royal Collection, and a David with the Head of Goliath, probably the version in the Brera. According to Baldinucci, Dolci painted three versions of this subject, the first for Marchese Pier Francesco Rinuccini and the second 'for John Finch, Resident in Florence for His Majesty the King of England, to whom the Resident gave it, and it was placed in the King's own bedroom'. The Royal Collection painting can be confidently identified as Dolci's second version of the subject. Unfortunately the Rinuccini version was last heard of in 1870, and its whereabouts remain unknown. The subject quickly became popular with Dolci and his followers, and various subsequent versions of this composition exist. Two authograph versions are known to survive in the Victoria and Albert Museum, London and the Gemäldegalerie, Berlin, while closely similar compositions in Glasgow, Phoenix and Boston are considered to be copies. The good condition of the painted surface of the canvas reveals the meticulous attention to detail that characterises much of Dolci's work. Although criticised by his contemporaries, such as Luca Giordano, for his laborious and time-consuming method of painting, here the artist's delicate handling gives his subject an arresting naturalism. Dramatically presented standing against a dark background, Salome holds out the platter as if presenting it to the beholder, and yet turns away herself. She is depicted as an elegant and luxuriously dressed young lady: Dolci gives detailed attention to the subtle textures of her costume, and his scrupulous rendering of the ornate jewels on the bodice of her dress, as well as her shimmering pearl jewellery, emphasises the richness and refinement of her attire. While the artist's depiction draws attention to Salome's lavish costume and elegant manner, he also captures her melancholy distraction as she appears unable to come to terms with the evidence of her own role in this brutal murder.